First performance: 17 April 2009, Stockholm Concert Hall. Magnus Svensson (pno.). Recording: Phono Suecia PSCD 178 (released 2009). Magnus Svensson (pno.). About the pieces: These three pieces for solo piano make use of music from the opera William (2006). They were composed as a birthday gift for my friend Pontus Lidberg (choreographer and dancer), and presented to him on his 30th birthday, the 27 January 2007. Pontus is also a rather accomplished pianist and these pieces are composed with a moderate difficulty level, so that Pontus will be able to play them himself. The titles refer to situations in the opera. 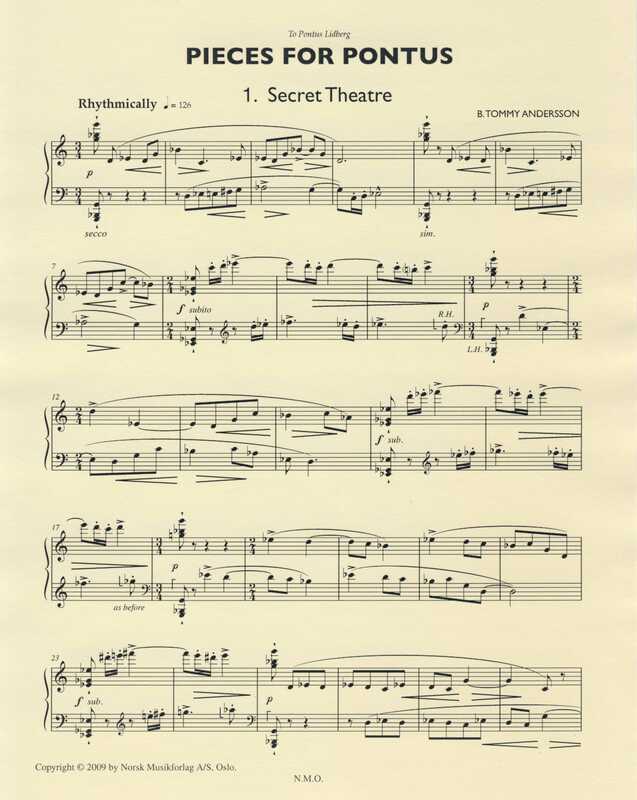 About the piece: Aforismer is the first piece ever that B. Tommy Andersson composed in twelve-tone technique, during the years he studied with Sven-Eric Johanson, a composer in Gothenburg.